It’s out! 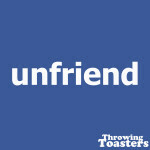 Another, brand new, Throwing Toasters song! It’s called UNFRIEND and it is available on iTunes, Bandcamp, CDBaby, Amazon.com and just about everywhere else that singles are available. This song was written a year or so ago, right around the time I was just getting completely frustrated with Facebook and being on it. I absolutely love how this song turned out and the magic Steve Goodie did with the instrumentation and the background vocals. I think it is some of the most fun rock ‘n’ roll from Throwing Toasters in a long time. When I wrote this song, I was pretty done with facebook. If you know me, or have looked for me on the social media site you know I don’t have an account. After several years, I began to realize that the social media service was just not my thing. The examples given in this song are pretty close to reasons why I left. While recording this, Steve made the comment that he thought it was funny that at the end I say it’s my mom, making the whole song about her. That made the baby in the second verse me. Or a sibling. I thought this was pretty funny. I’d never thought of it that way. In my mind the song is about three separate people. For the record, I was still friends with my mom when I left Facebook. The final verse is not about her. Honest. And while you’re at it, be sure to Like me on….oh…never mind. Happy Friday! Welcome to another edition of What Others Are Creating where I look at some of the creative projects that I’ve seen various artists working on this week. My hope is to share them now with you and perhaps you’ll find one or two to check out further and possibly support. Decoder Ring Theatre – http://decoderringtheatre.com – As someone who has been podcasting in one form or another since 2004, I’m often ask which podcasts I listen to. Decoder Ring Theatre is one of the best and one of the longest running audio drama podcasts on the web. It’s got action, adventure and laughs for folks of just about any age. And not only is the content amazing, their production schedule is something to aspire too. I will always mention Decoder Ring Theatre and the Adventures of The Red Panda as one of my favorite podcasts to listen to. I’ve been subscribed since the day I found it! Check them out. The Ukulady – http://www.theukulady.com – The ukelele has become a ubiquitous instrument. Everyone everywhere is now playing the damn thing. Once relegated to hawaain shows, the Hipster wave has grabbed hold of the mighty ukelele and now it’s a badge of coolness to play the ukelele. Well, long before this current wave of coolness, The Ukulady was making the ukelel cool by singing her offbeat tunes while strumming the instrument. I’ve known The Ukulady for some years as we’ve travelled in the same circles and have always been impressed she’s built a very successful children’s act around The Ukulady. CLICK HERE to watch a fun medley of ’80s Television Theme Songs performed live in front of a raucous audience. Just three minutes of nothing fun. Jody Whitesides – http://jodywhitesides.com/blog/ – Jody is a guy I met around 1998 while doing open mics in Southern California. He has been a friend ever since. If you’ve followed any of the projects I’ve worked on over the years, you have, no doubt, heard his name or heard his music. He produced and played bass and guitar on the Throwing Toasters album CHROME, he did all the music for The Radio Adventures of Dr. Floyd and his song Christmas Brought Me You is the theme for my yearly Advent Calendar. Jody is in the process of working on a new album of songs and he’s blogging regularly over at his website. Go read through some of his recent posts and check out a few of his songs. I’m sure you’ll be rocking out to one or two of them. Plus his blogs are a good read about pop culture and art creation from a musician’s point of view. Finally this week I want to leave you with a short video clip. It’s a segment from Penn’s Sunday School, a weekly podcast hosted by Penn Jillette of Penn & Teller. It starts with Drew Carey talking about some advice he was given a long time ago and I think it’s something interesting to think about in terms of creativity. I’ll let you watch it and see for yourself. This is Penn Jillette here, so some of the words are NSFW. Give it a listen and let me know what you think about Being Great or Being Anonymous when you’re just starting out something. That’s if for another week. If you have a project you would like me to check out, please feel free to leave a link to it in the comments below. Always interested in seeing what people are coming up with. Have a great weekend and I will see you back here on Monday morning for another Creative Mondays! Copyright © 2019 Grantblings. Entries (RSS).